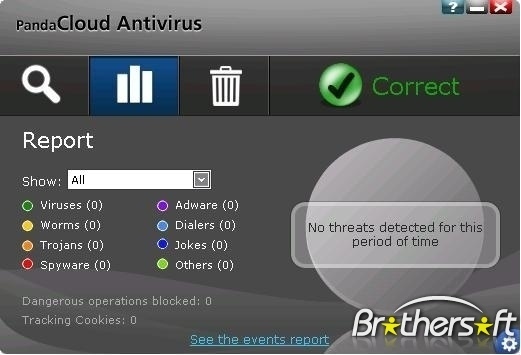 First free cloud-based antivirus with less impact on PC performance.Edit by Brothersoft: Panda Cloud Antivirus Free Edition is the first free cloud-based antivirus. This fast and light solution connects in real time to PandaLabs Collective Intelligence servers, protecting your computer from the latest malware variants. Thanks to the Collective Intelligence knowledge base, this antivirus detects more malware than other traditional solutions. It is light, secure, and easy-to-use. It protects you while you surf the Web, or play and work online, and you won't even notice it's there. Thanks to its cloud-based scanning you'll have maximum rapid protection against even the very latest viruses. Just install and forget Panda Cloud Antivirus Pro and you won't have to worry about updates, as all the work is performed in the cloud. It applies non-intrusive intervention techniques and can Detect even the very latest unknown viruses. This new version includes behavioral blocking to prevent viruses from launching suspicious actions. It also offers a PC Vaccine feature to protect you from USB drives running automatically when they Connect to your computer. It protects your identity and your passwords, and allows you to remove all traces of your Internet activity. Similarly, it lets you surf the Internet anonymously, thereby preventing your personal Details, identity and movements from being visible to others. With this free antivirus, Panda Security presents a new security model based on ultra light architecture to process and block malware more effectively and efficiently than traditional products which rely on locally installed signature files. Traditional antivirus products for PCs use a series of locally installed technologies, resulting in considerable use of memory and other computer resources, and consequently negatively affecting system performance.In short, this antivirus works for you. Simply... Evolution. you can free download Panda Cloud Antivirus 1.3.0 now. * Web & URL filtering against exploits and drive-by downloads. * New user interface for unified management of Recycle Bin and Quarantine. * Automatic and transparent ugprades to new program versions. * No more nagging advertising popups. * Hot updating of behavioural blocking rules. * Change in the versioning format. From now on it is 1.3.0 instead of 1.03.00.0000. * Added "suspicious" detection counter in the statistics window. * Immediate notifications of virus detections. * Ability to re-do detections after excluding them.